Recently I was browsing the produce department and I saw an interesting looking fruit I had never seen before...it was a longan fruit. The fruits were little brown balls attatched to the sticks from which they grew off of...not the most appetizing looking fruit, but I was curious! So I bought some, and decided that they needed to be tasted! I read up on them a bit and found out that they were similar to the lychee fruit. When I first attempted to eat one, I discovered that they slipped right out of the brown covering, revealing a clear white flesh with a large black seed. They kind of looked like an eye in a way...wierd looking, but what would they taste like? So I popped the flesh into my mouth, and what I encountered was a bit like a sweet flowery tasting cucumber flavor...sort of like a melon crossed with a cucumber. 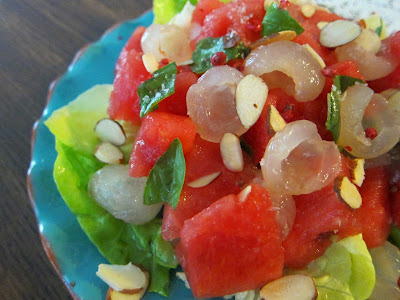 So I decided that they would be wonderful in a salad paired with watermelon! I made a vinaigrette with citrus and gin, since those things pair well with melon and cucumber, and sprinkled some almonds, basil and pink peppercorns over the top! It all ended up being a wonderfully refreshing combo! I was glad I decided to try out the foreign wierd looking fruit! Although it doesn't seem so wierd anymore. To make dressing, whisk all ingredients together. 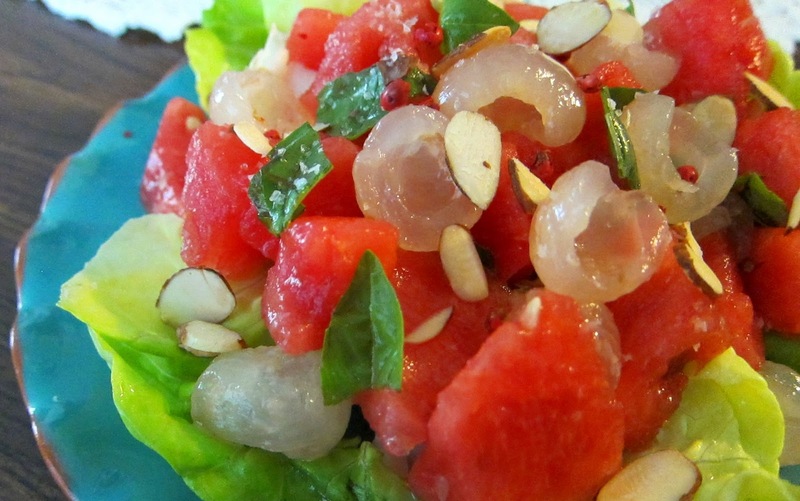 To assemble salads, place the salad greens on two plates dividing evenly between the two. Arrange the melon and longan fruit decoratively atop the greens, scatter the almonds, basil and peppercorns over, then drizzle each salad with the dressing, and top with a sprinkle of fleur de sel. 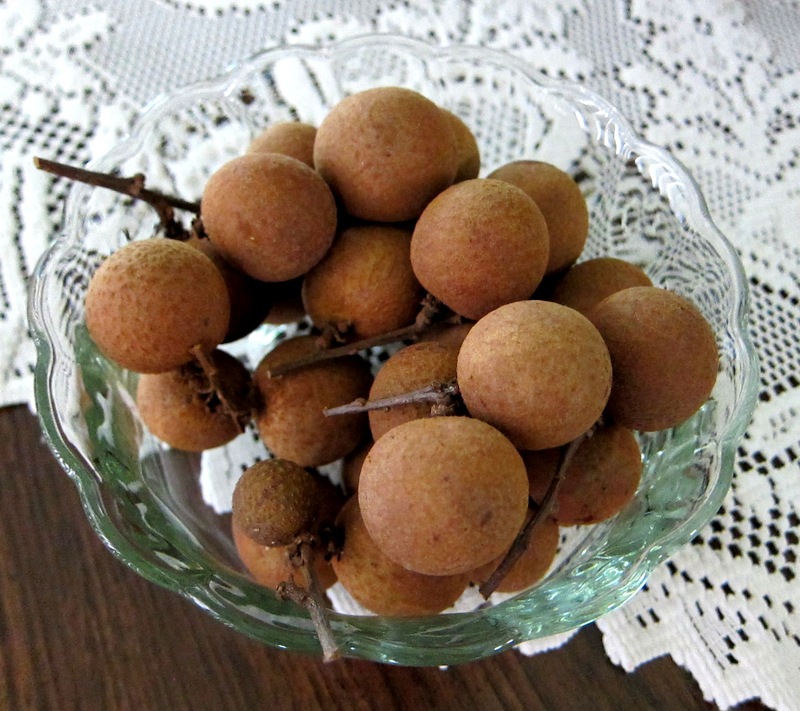 WOW I've never heard of Longan fruit until now! 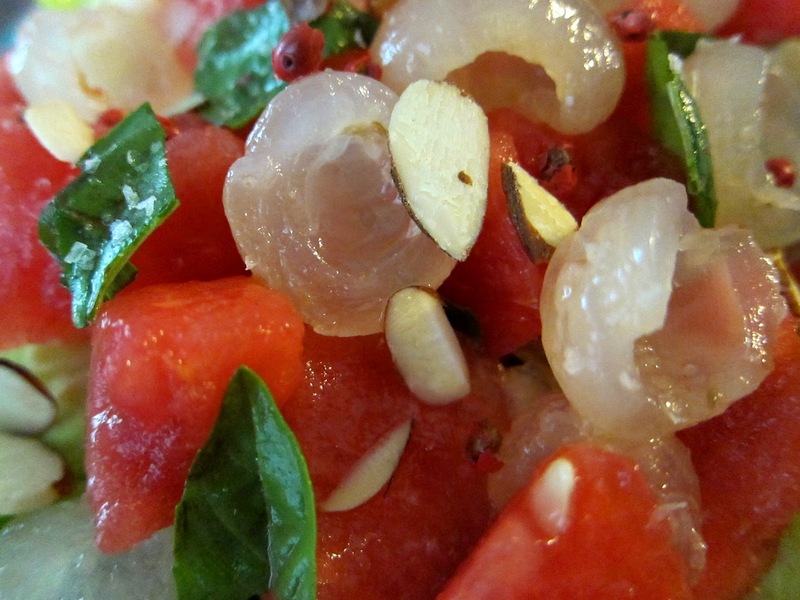 it sounds very delicious, I wonder where I could find it in my neighborhood so I can make this wonderful salad! Thanks for sharing! How beautiful and unique. Great use of an obscure fruit. I went to school in New York and lived in California for years before I moved back to Taiwan where longan fruits are abundant in July, Aug season. I can really appreciate this creative recipe of yours.